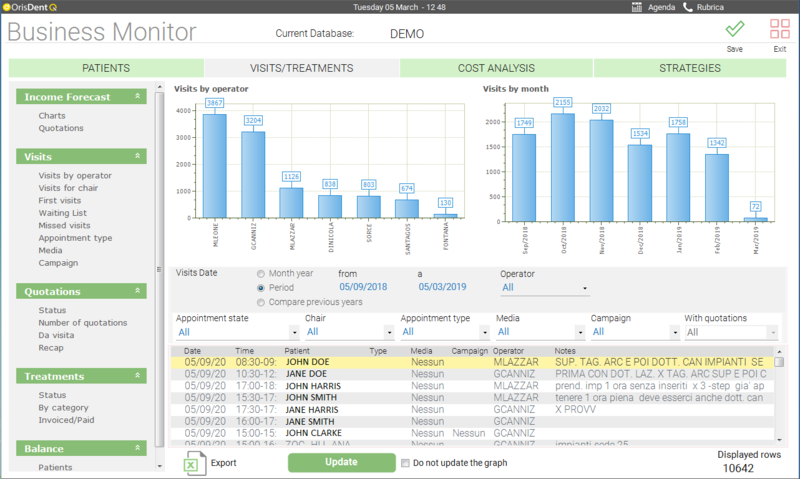 software to check and analyze the costs of the dental practice, Business Monitor in OrisDent evo. Keep control of your business, improve the results day by day. 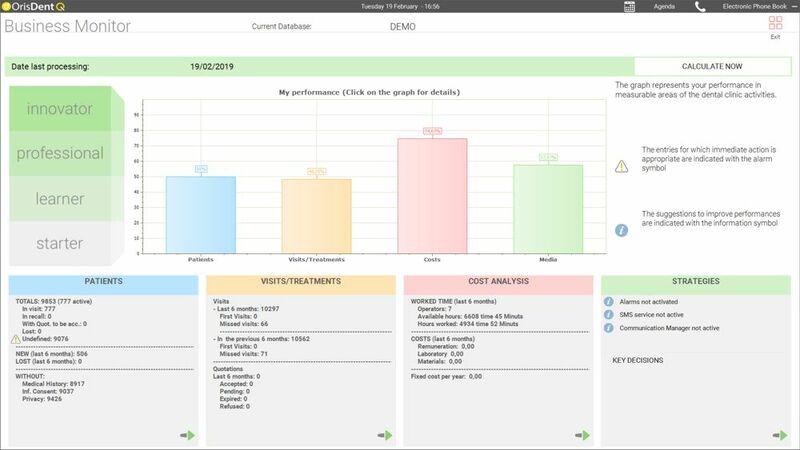 Find out all the advanced features of the most innovative module for the management of your Dental Practice performance. are you sure you are able to manage them efficiently? and how profitable is an executed treatment? and manage each department in the most efficient way? 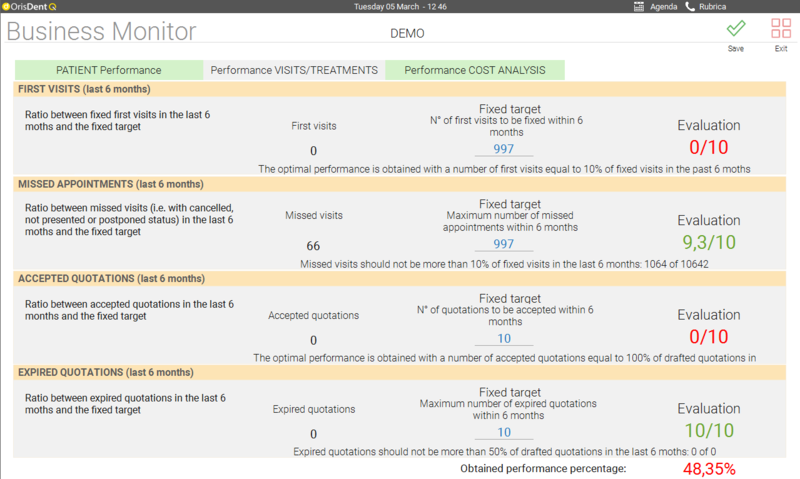 Analyze your data and calculate the performance of the Dental Practice. 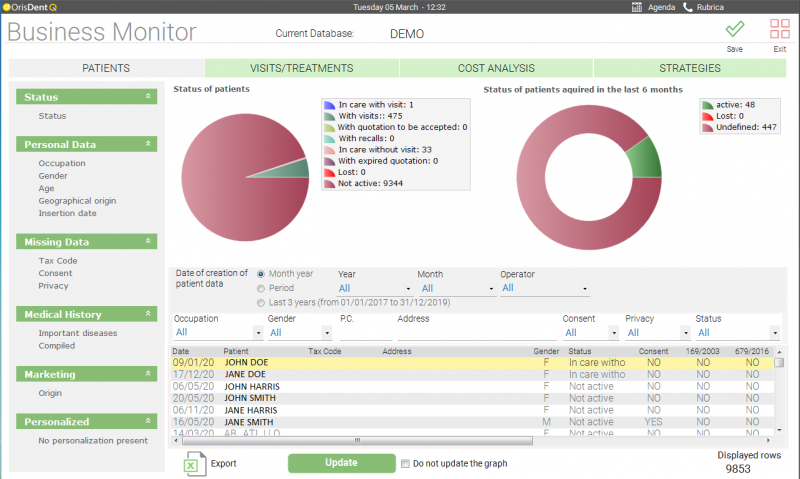 The Business Monitor allows you to display in a fast and easy way statistics on patients, appointments, treatments and costs of the practice. On the basis of the processed data, OrisDent calculates the percentage of the activities for each area in order to constantly monitor the performance of the business. For a more effective management you can plan your goals in order to achieve the maximum performance. If you achieve all your targets the performance will be of 100%. New patients and lost patients. In most cases the relation that the patient has with the dental practice begins in case of need, lasts for all the entire treatment process and ends with the payment, if everything goes well. The dental staff has to ensure the relationship between the patient and the practice by sending reminds and encouragements. All the patients that haven’t received a reminder or arranged an appointment are all potentially lost patients. – the number of patients that have not signed the informed consent or the use of personal data. 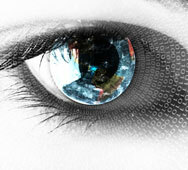 To increase the profitability of your Practice it is important to carry out target marketing actions. 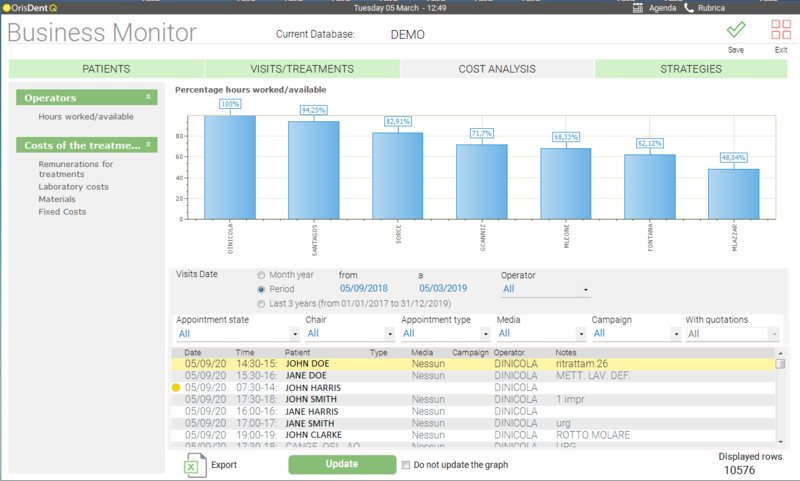 The patient profiling is a new marketing strategy that allows you to process data related to one or more customers/patients in order to divide them into groups based on age, gender, interests and behaviors. This will make it easier to choose the most effective tool to use. 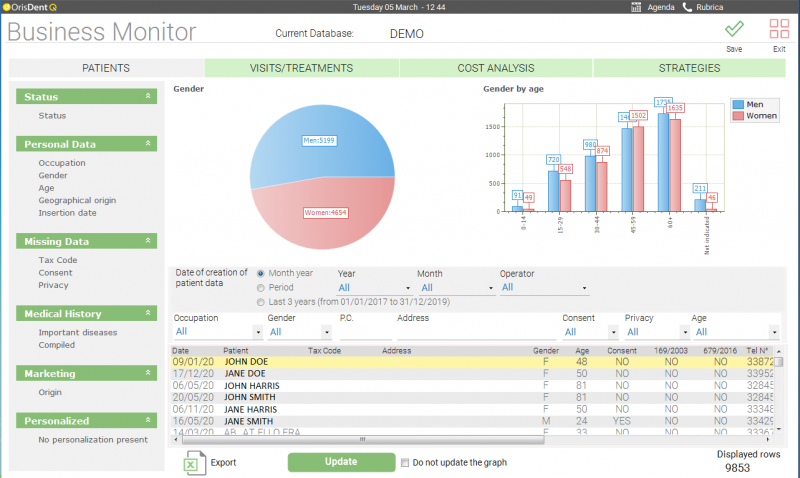 The Business Monitor analyzes patients according to their job, age, gender and geographical area. Check the status of appointments and quotations. What is the cost of a missed appointment? How effective are your quotations? In the case they are not accepted do you always know the reason? Answering to these simple questions will improve the success rate and thereby increase the turnover of the dental practice. – the number of expired quotations in the last six months. Predict to be able to plan. OrisDent provides all data to be able to get in a few seconds an estimate of revenue based on various elements extracted from the medical records, the quotations and the arranged appointments. From the number of accepted quotations we can get an idea of the amount of work in the coming months. From the arranged appointments, the executed and not executed treatments we can define a turnover forecast. These statistics are very important in the management of a company because they make us aware of the financial means in the short, medium and long term. This makes it easier for the investment planning and in case of an emergency response. Check costs and improve the results. 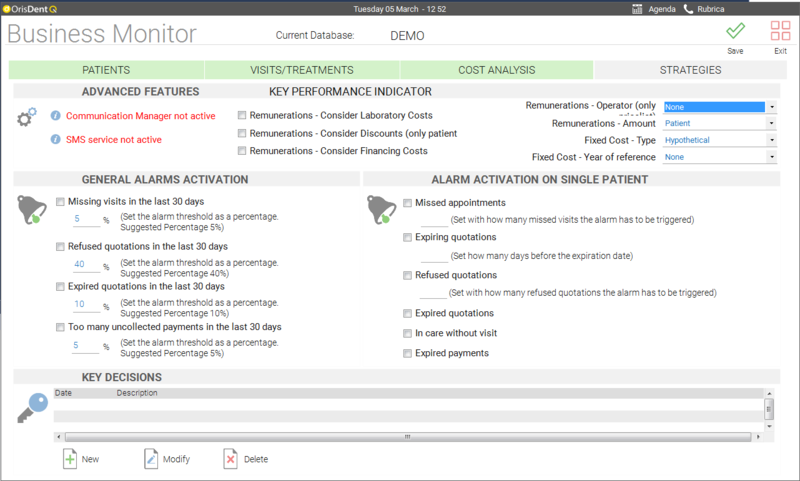 Thanks to the Business Monitor you can always keep control of the costs of your dental practice. The hours of work compared to the available ones, the compensations on the executed treatments, the costs of the dental laboratory and of the used materials, the fixed costs… all these elements are used to calculate the hourly labor rate compared to the ideal one. The real cost is actually the cost carried out by the dental practice, based on the working hours. The ideal cost is the cost that the practice should support in order to have an optimized cost per hour. You can be noticed whenever certain parameters exceed the “normal” values, simply by activating the alarms. If there are problems you can promptly intervene with target actions in order to keep everything under control. In OrisDent you can set the Key Decisions, that are the “behaviors to be adopted” (for example flyering, create a specific campaign on the Facebook page of the practice, setting reminders for all patients, a direct mailing to promote a service…). At any time you can check if the action taken has brought a real improvement of the practice performance.